September 11, 2001 was a new years day in Ethiopia. I was in Addis Ababa, the capital, anxiously waiting to start college when a rare opportunity to attend a live concert presented itself. The Gadaa Band had a concert at Hawi hotel on Bishoftu Road. 2) Although located at the heart of Oromia region, it is rare to find Oromo speakers in the city, let alone a live concert. This was to be the first time ever I saw so many Oromos in one place in Addis Ababa. Oromo people constitute the single largest ethnic group in Ethiopia. Oromo artists Zarihun Wadajo, Jawe Bora, Adnan Mohamed, Addisu Furgasa, Addisu Karayu, Anwar Badhane, Dabala, etc took to the stage one after the other. Songs of freedom, songs of unity, bravery, love, and those extolling the hard life of the peasants were played. The bravery of the singers, and even more poignantly those who attended the concert, for singing songs of freedom so close to the belly of the beast was incomprehensible. A vivid memory of the dance floor is seared on my mind to this date. That was before I was overcome by the feeling of nationalism and got myself in the mix. The rest of the afternoon, all I remember is sweating and celebrating what at the time felt nothing short of liberation. By the end of the concert, outside, life seemed to go on as usual. Taxi helpers called out names of routes and destinations in a rumbling noise and urgent manner. Passengers rushed to get in on the first taxi on the line, stepping on each other’s toes. I got home late in the evening, still overcome and awed by joy. The thought of what I saw and witnessed brought smiles to my face. It was one of the happiest days of my life. Little did I know that miles away thousands were witnessing the worst day in their lives. At 2 a.m. Ethiopian time, I tuned to the state-owned ETV, the only television station in the country for news and New Year programming. I had to go a neighbor’s house to watch it. But instead I saw, two tall buildings burning, the TV caption in Amharic reading something like “America is burning.” It didn’t strike me as a big deal. I don’t remember paying much attention to what was at that time a developing story. I had no idea I was watching an event bound to change the world for decades to come. The only surprise was that ETV interrupted its regular programming to broadcast about a burning of buildings at some faraway place. To put it in perspective, this was before the advent of social media when Ethiopia was still relatively untouched by technology at the time (it still is). Here I was prepping to start freshman year in college, but didn’t even know the Internet existed. After that day, the only newsy thing that stuck in my mind was the reported death of someone of Ethiopian origin on that tragic day. Local Amharic dailies might have written stories about it. I didn’t read newspapers in those days. The event that was to change the world forever passed as no event for me. A little over a year later, I was in New Jersey, not too far from where the Twin Towers of the World Trade Center once stood. By that time, I knew a little more about what happened on September 11, 2001. However, on my first day in America, fresh off the boat and traveling alone, with very little English (Americans spoke fast), and not knowing where I was going, the thought of 9/11 didn’t even cross my mind. I lived in the U.S. during the buildup for the Iraq war, the controversy over CIA renditions, Gitmo-gate, etc. Studying international relations provided additional insights about the implications of the horrific event of 9/11. The United States war on terror, directly as well as through proxy, made the significance of 9/11 the more personable. Historically seen as a buffer between the East and the West, Ethiopia was quick to jump on the bandwagon. Desperate to squash a growing discontent against its repressive rule, Addis Ababa needed a pretext to harass, jail and indefinitely hold those seen as a threat to the regime’s power – real, perceived or otherwise. Then came the Ethiopian invasion of Somalia in 2006. 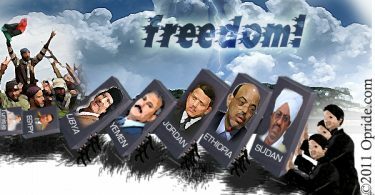 Since that time under the pretext of counter terrorism, more people were thrown behind bars and held incommunicado – Ethiopians and foreigners alike. The British Broadcasting Corporation (BBC) once referred to Ethiopian prisons as African Gitmo (also see my article: One Gitmo At A Time). There is no dispute that the events of 9/11 transformed the way we travel, share information, and handle international relations on many levels. So many innocent lives were lost on that tragic day. So many more lives were unfairly affected by the consequences of that heinous incident. Hundreds still bear the brunt. A growing state of Islamophobia, the threat to burn the Quran, the proposed ground zero mosque controversy, the underwear bomber, and the ultimate killing of Osama Bin Laden, all became part of American history shaped by 9/11. On this day, the 10th Anniversary of 9/11, I am covering a memorial event in the Bronx with mixed feelings. Living in New York City brings the event much closer to home. America was so far away 10 years ago, its suffering only a distant mirage to me. Just like the world around me has changed, my life has also changed for the better. I now have a better chance of taking part in a live concert something that was a very big deal then. My feeling of liberation has been realized but only in another country. In couple of hours, I’ll be attending a memorial honoring those who became victims of that savage cruelty. What was least important 10-years ago is the most important event today. Once a far away place, I now live in New York. Setting feet on ground zero for the first time is a bit intimidating. But I am eager to bear witness once the memorial opens to the public starting September 12, 2011.